What does the date on the container mean, and is it safe to eat yogurt after this date? The date stamped on the container is the use-by date. For the best quality and freshness, you should use the yogurt by this date. Yogurt must be refrigerated or kept chilled. We recommend using the yogurt within seven days after you've opened it. It's normal for a bit of liquid (whey) to separate from our yogurt. It occurs when there's been pressure applied or when the yogurt has undergone a temperature change. We don't use artificial thickeners to prevent this. Whey contains many of the important vitamins and nutrients in yogurt, so we recommend you simply stir it back in. Yes, but the yogurt's look and texture will be affected. Freezing can also destroy some of the beneficial cultures in our yogurt, but there'll still be plenty to give you added health benefits. The cultures become dormant when frozen, but once thawed, either in the refrigerator or in your stomach, become live and active again. 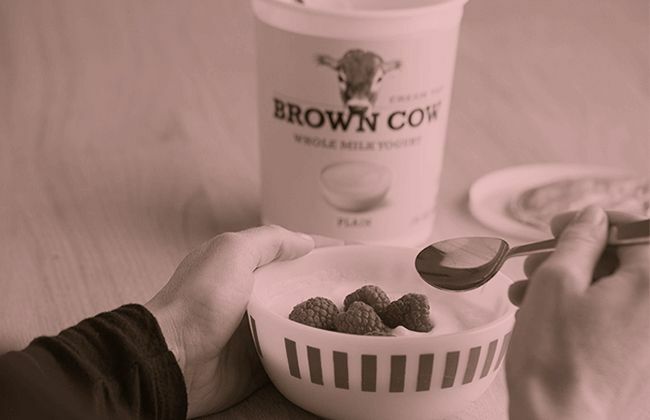 Even if you freeze our yogurt, you should still use it by the use-by date stamped on the container. Does heating yogurt, as when cooking with it, affect the cultures? It can. Heating yogurt to high temperatures destroys the cultures. To prevent this, never add yogurt directly to a boiling or extremely hot mixture. Instead, stir a few tablespoons of the hot food into the yogurt, warming it gradually. Then stir the warmed yogurt into the hot mixture. Do this near the end of the cooking process, so the yogurt won't be heated for a long time. If the temperature is higher than 120° F, as it is in baking, the live active cultures will not survive, but the yogurt will still provide valuable nutrients such as calcium and protein. 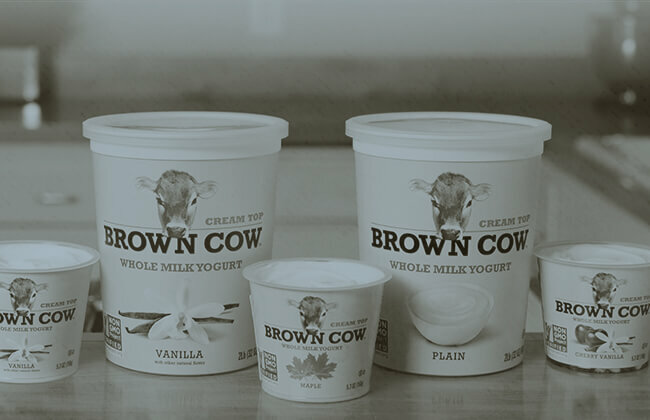 Is Brown Cow yogurt gluten-free? Yes. Our gluten-free certification tells folks with gluten intolerance (celiac disease) that they can enjoy our yogurts without worry. My local recycling center doesn't accept #5 plastic. Why do you make your cups from it? The manufacturing of our polypropylene #5 cups requires less resin than that of high-density polyethylene #2 cups. 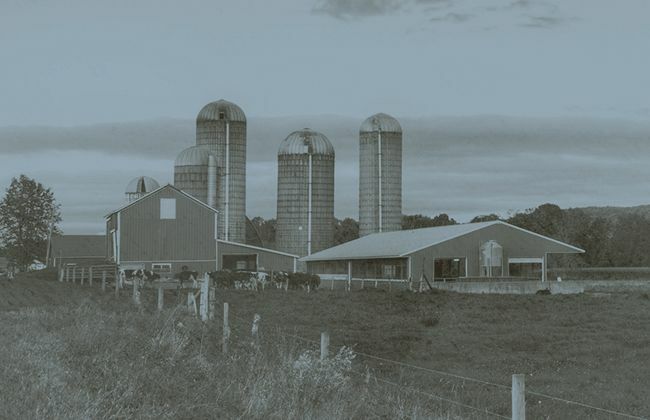 So less energy (electricity and gas) and fewer resources are used to produce our #5 cups. And because they have thinner walls, #5 cups make less waste than #2 cups. Although #5 cups are less often accepted at recycling centers, their overall environmental impact is less than that of #2 cups. We used to package our yogurt in #2 cups because we thought this was the most recyclable material. But we learned that many recycling centers cull #2 cups from their recycling piles, recycling only the bottles and sending the cups to landfills. This is because bottles and cups have different melting points and can't be recycled together.